Rescue Containers Archives - Apco Aviation Ltd.
Will fit Any Apco Mayday, from 16 SLT up to Mayday 20 standard version. Big deployment handle and comfortable side location of the Mayday for maximum ease of use! 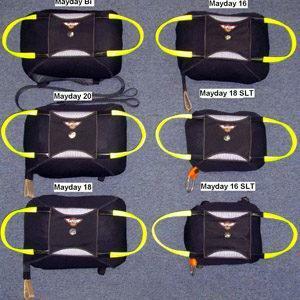 Designed to fit any Apco Mayday, from 16 SLT up to Mayday 20 standard version. Large deployment handle and safe, visible side location on the harness. Can be zipped onto either side of the harness. Light weight, simple and elegant container for paramotor or free flight use. Includes an optional flight deck with space for two instruments. The Universal container has multiple attachment points to accommodate mounting on most paramotor frames/harnesses. light weight simple and elegant solution for your reserve. (CONTAINER ONLY! ) The best made, best looking, universal emergency parachute container designed to fit most frames, offering easy operation, safe deployment and convenient location. Can be fitted to any certified harness on the market today.